Tested to meet or exceed U.S. Department of Defense Standard 810F/G durability tests. The Dux is designed to work seamlessly with your new Surface and its Type Cover. 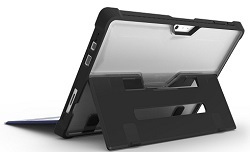 Tough, reinforced TPU and polycarbonate construction protects from inadvertent drops. Slim and lightweight design yet super protective. The new Infinity Hinge stand allows for almost limitless viewing and typing angles. With built in pen storage and clear polycarbonate back panel for asset tagging or a custom look, your Microsoft Surface Pro 2017 or Surface Pro 4 never had it so good!